On June 21, few of my friends from my blogging community planned for a get together at Phoenix City Mall, Chennai. We planned to have lunch together, but at last moment I was not able to make it up for lunch due to some unexpected work. When I called them up and inquired if they can wait for me, they were kind enough and agreed. Thanks to my hubby, who was managed to drive his car in the traffic and ensured we reached the spot without any further delays. We had a small chat, few clicks and the get together was memorable. My fellow bloggers presented me some nice food props. Using those props, I will try to post recipes. First entry comes from Lubna. I know Lubna as a Bangalore based blogger and started reading her articles from the time she started posting a series on food photography. All were very useful and I started to refer them for my photography. 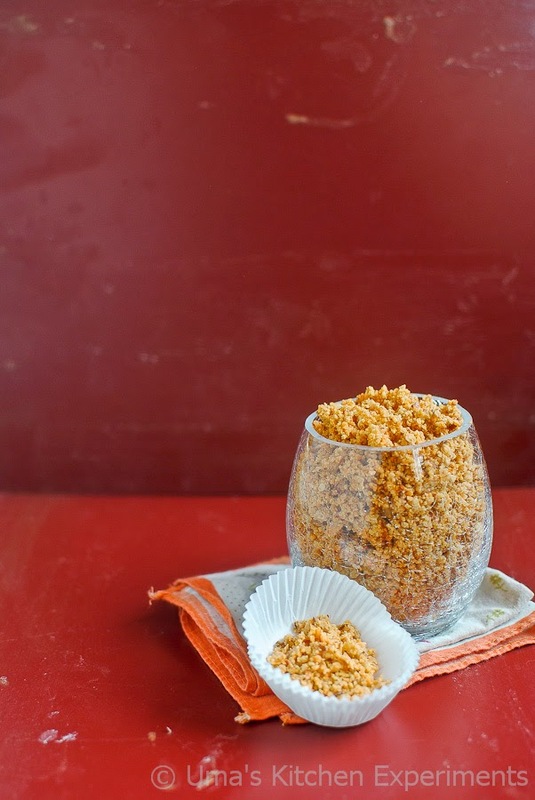 There are many alluring recipes in her blog and the spicy peanut powder drew my attention. 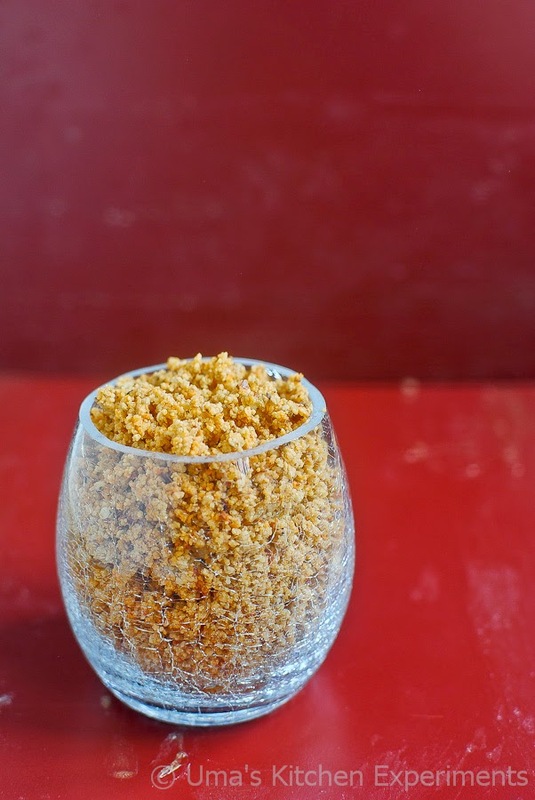 Having my roots in Andhra, we used to prepare peanut powder (called as phalli podi) at our homes. But the method used at my home is slightly different from what Lubna has posted. After doing some browsing, I came to know that there are different ways of preparation and all are traditional. I wanted to record her method since the preparation is very easy. The preparation of this powder is very easy. 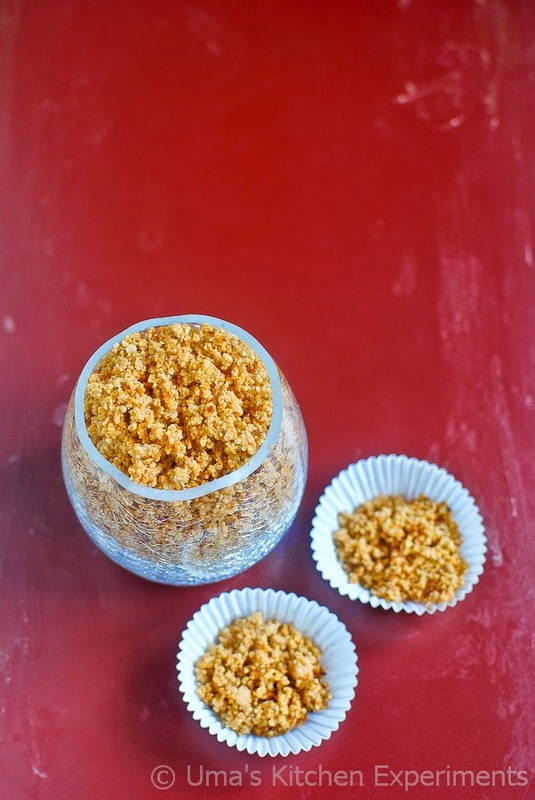 It has only 4 ingredients and but it has only few weeks of shelf life. I promise, It wont's lost that long, if you love peanuts. Also, after grinding it, the powder tends to stick to form a mass. To prevent it, cool down in a wide plate and store it in a container. 1) In a heavy bottom pan, dry roast peanuts. Once done, transfer the contents to a plate and allow it to cool down to room temperature. 2) To the same pan, add cumin seeds and dry red chillies and roast it well without burning. Allow it to cool down to room temperature. 3) Rub the peanuts between your palms and peel off the skin. 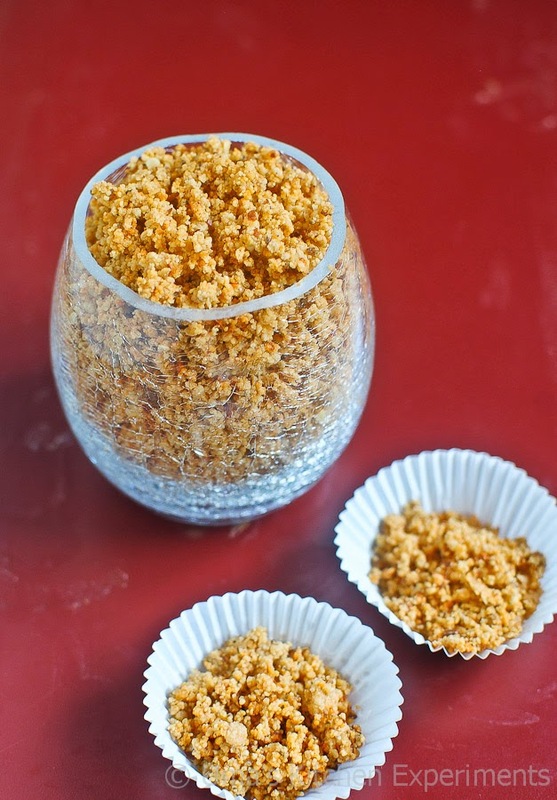 4) Grind all the ingredients together and make fine coarse powder. 5) Add salt towards the end. 6) Cool down and store in a air tight container. 7) Tastes good with hot steamed rice. Thanks Lubna for beautiful self cracked textured glass and cute mini cupcake liner. I loved that fridge magnet too. 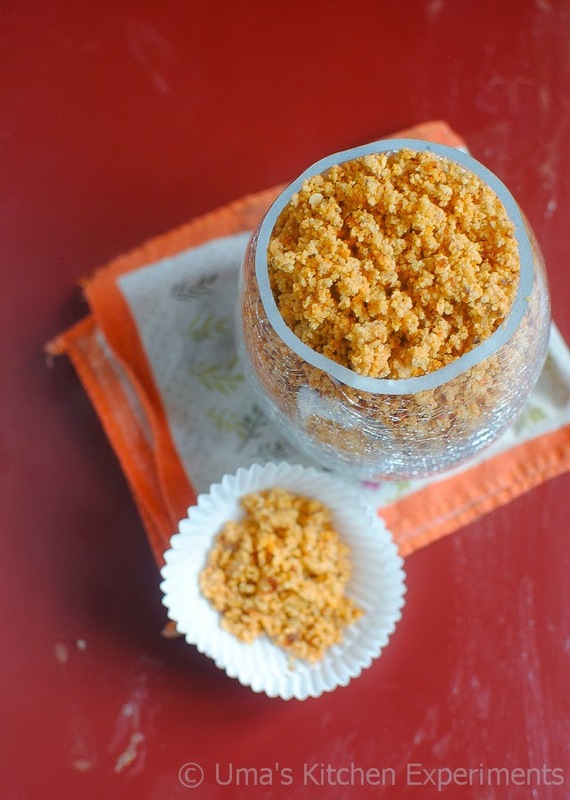 wow such a versatile podi recipe. must try this out. nice powder and the bowl also looks very nice..
tis s such a good one..
Good pic indeed but that fancy cup goes well wkth milkshakes,,,,!!!!! !